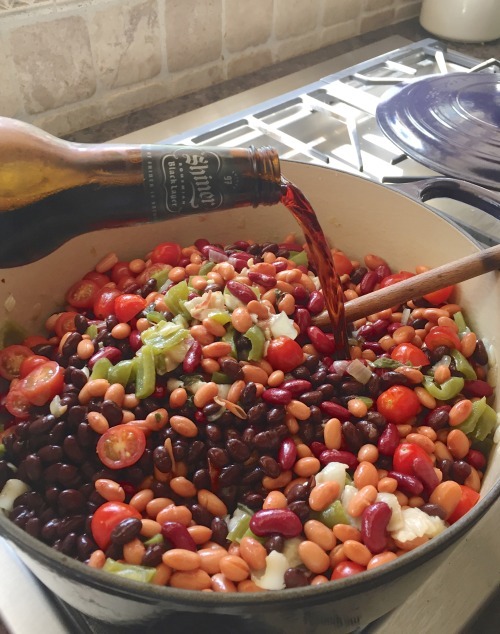 You may know these as “drunken” beans. People have been doing drunken beans for years I guess. We grew up eating those baked beans that are loaded with bacon and brown sugar, mustard, ketchup and baked a long time in the oven. 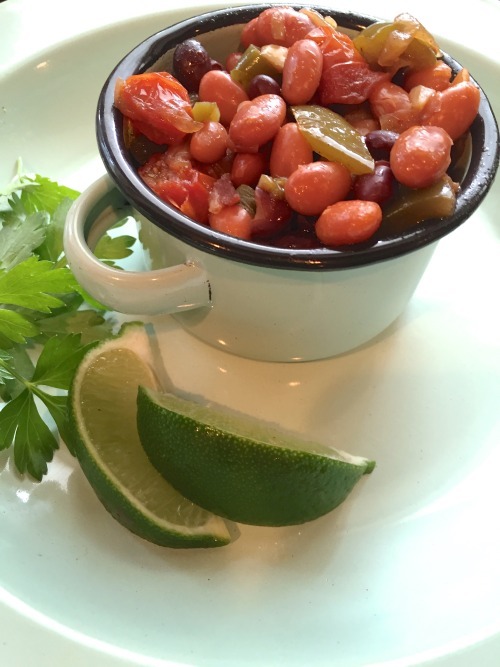 Most recipes for drunken beans just call for pintos but I’ve started using a mixture of beans even in my chili. 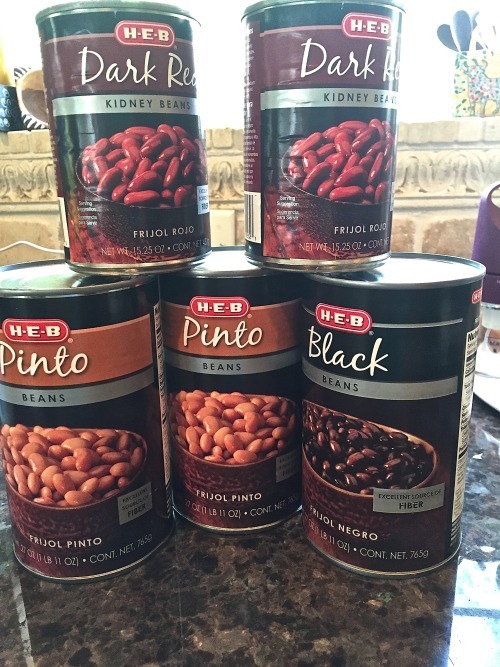 For these beans I used kidney, black and pinto beans combined. I used a dark beer but any kind of beer will work. The one thing I did wrong in this recipe was to not brown my bacon. Don’t ask me why I didn’t do it. 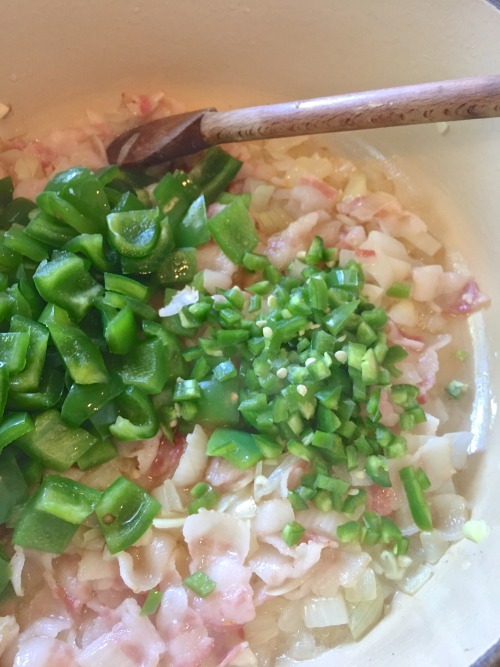 I have always browned the bacon in baked beans or any kind of dish that calls for bacon. I got in a hurry and just threw it in the pan with the onions and it never browned. I love my cute little cups that I picked up in Savannah at Lily Bay and they just happen to match plates that I bought at the Round Top Antique market back in March. BLAST FROM THE PAST: Pickled Shrimp in a Jar is a recipe that I posted back in 2012 and is a great cold appetizer for your summer parties. 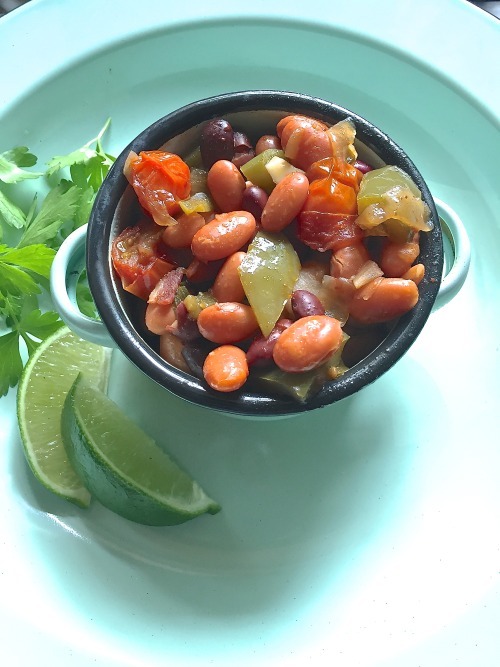 Most drunken bean recipes call for pinto beans only. 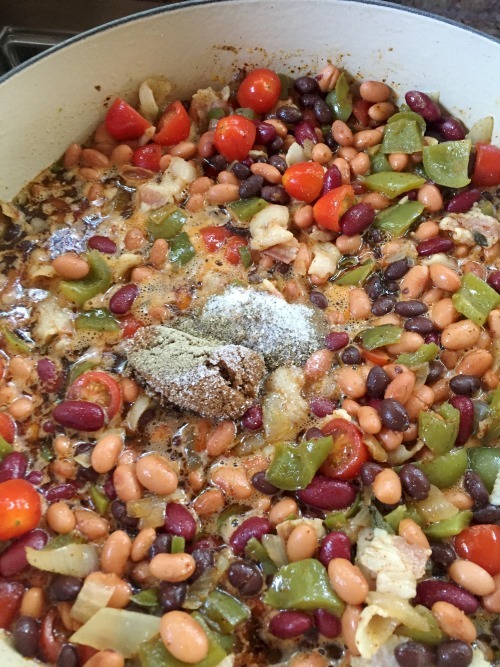 I like to use the black beans and kidney beans also. Don’t do what I did, but do what I say — Brown your bacon FIRST and then remove from pan. Saute the onion in the bacon fat that is left behind in the pan. I got ahead of myself and threw the bacon in with the onions thinking it would brown and it never did. Drain the bacon on paper towel and reserve it until the end. Add the bell pepper and jalapeño and saute for about 5-6 minutes. 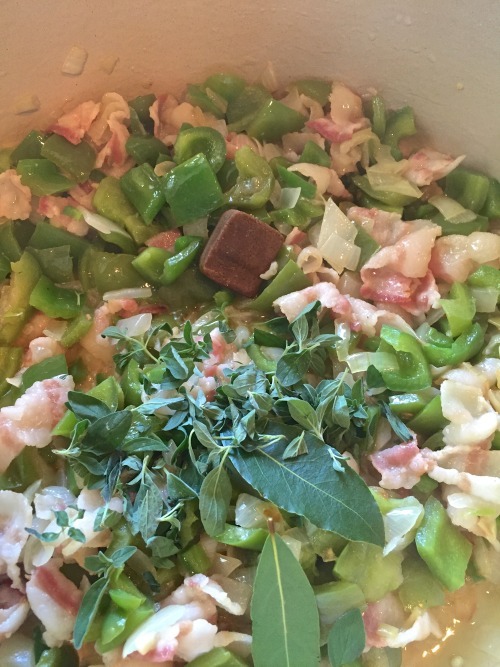 Add in the chopped oregano and the bay leaves. I added a beef bouillon cube because I didn’t have a can of beef broth. 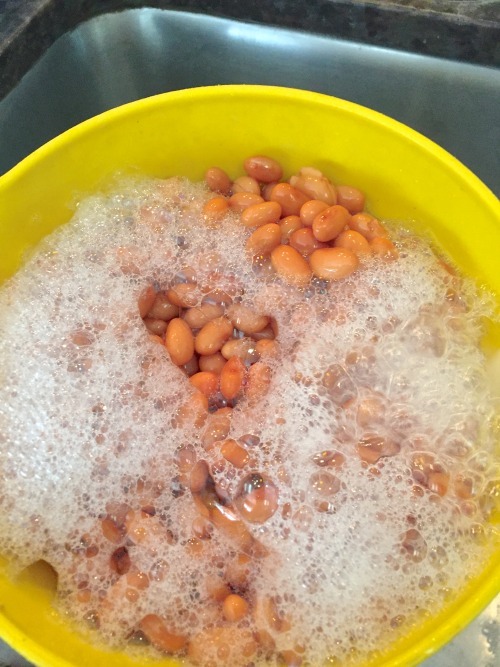 Rinse your beans in a colander. I have no idea what the preservatives are in the beans that make them foam this way until you get it rinsed off. Nice and rinsed and ready for the pot. 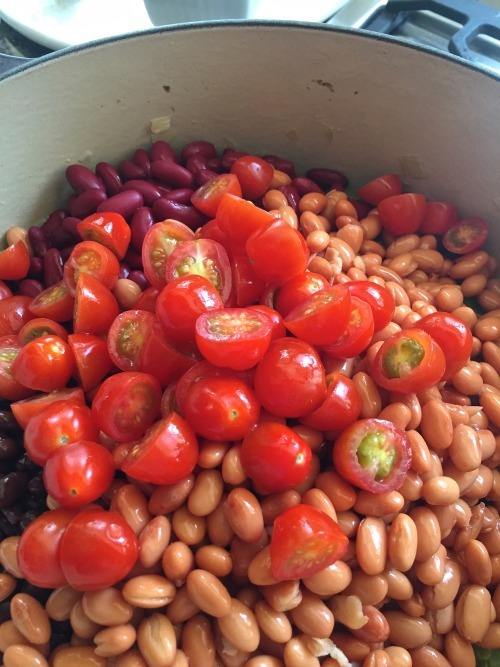 Add the beans and tomatoes to the pot with the onions. Add in a bottle of dark beer. I decided to add in some brown sugar and salt and pepper . 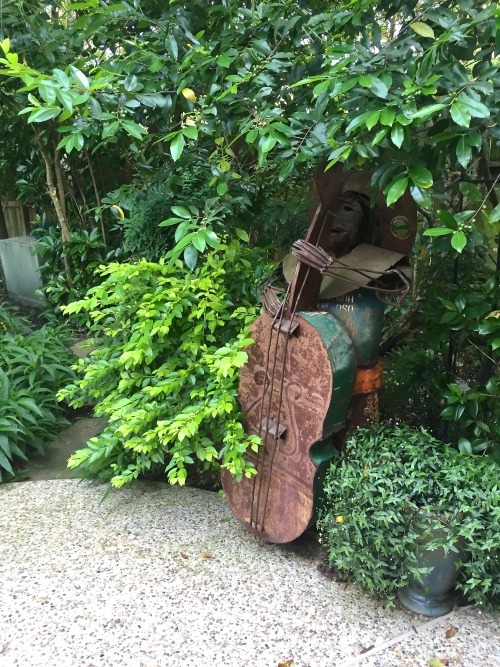 We let them simmer away on our outdoor “power” burner. If you didn’t mess up like I did, add the fried bacon in now and you can add a handful of cilantro too if you have it. Our entertainment for the night. 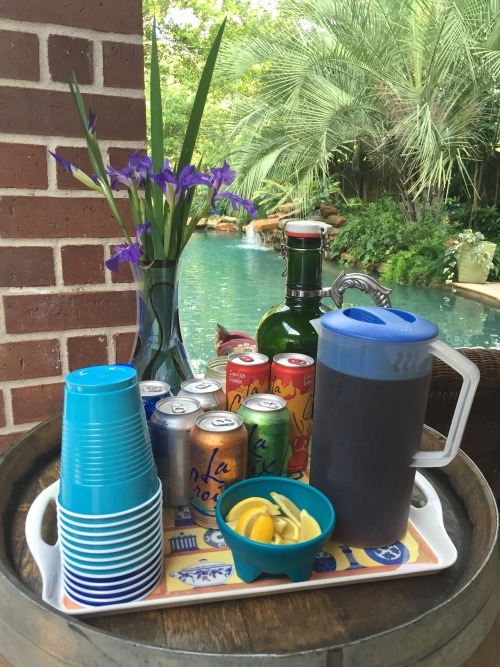 Our non-alcoholic beverages. Don’t think anyone drank any of these. 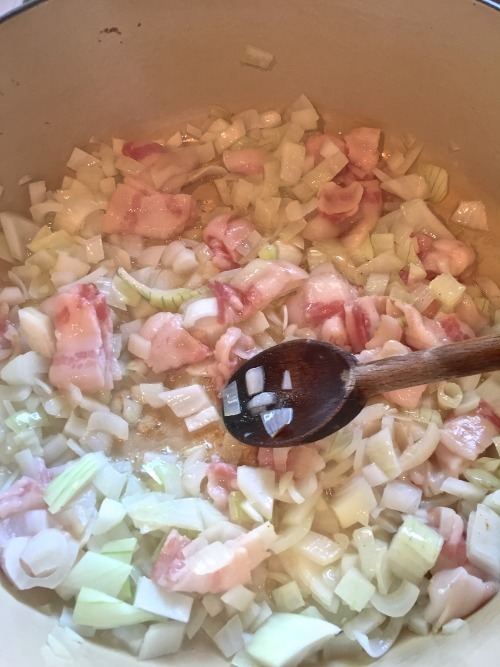 Chop the bacon and put in pot and cook until all the fat has rendered out and the bacon is brown. Remove bacon to drain on paper towels. Crumble and set aside until end of cooking time. Put the chopped onion, garlic, tomatoes, bell pepper and jalapeño in the fat and sauté for 5-6 minutes until the onions are translucent. 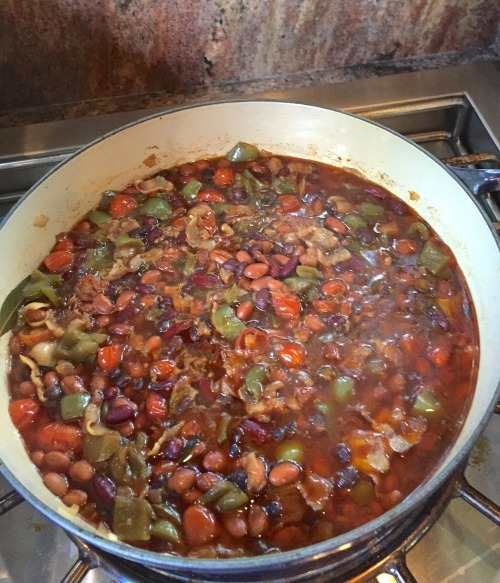 Drain and rinse all the beans and add to the pot along with the broth, spices, brown sugar and beer. Simmer for 1-2 hours (or longer). Add in the crumbled bacon and cilantro about 30 minutes before serving. 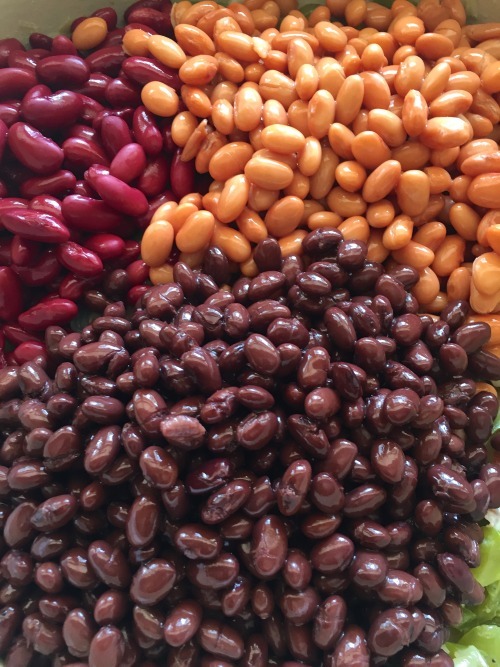 You can add any type of bean you want. If you need more liquid add either another beer or more beef broth.